The world of Mixed Martial Arts has always been something that eluded me for quite some time. Sure I heard the term MMA being mentioned many times in my circles of friends but somehow the idea of putting two competitors from possibly different fighting disciplines together seemed so alien to me. 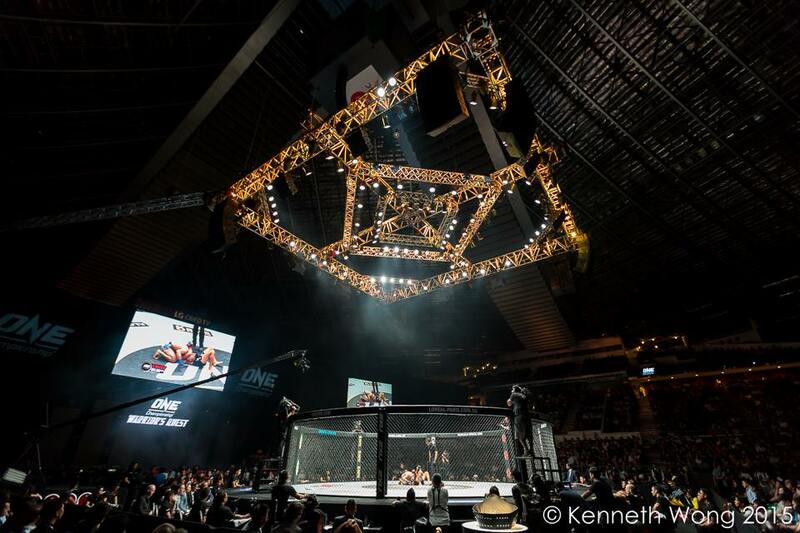 That was until I stepped into the world of MMA with ONE Championship’s ONE: WARRIOR’S QUEST. 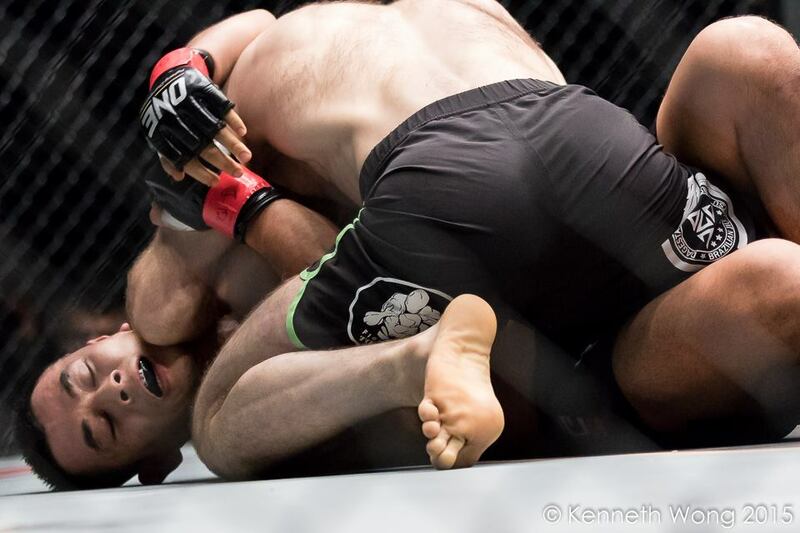 With thanks to Canon EOS World, 5 photographers got the chance to step into the “Scared Ground” of being cage side to capture all the adrenaline pumping action and I got to shoot 2 matches that night as the 4th shooter. Even before the event started, the whole placed shone with the cage in the centre of the Indoor Stadium with lights that made the concert shooter in me green with envy. Light is an important component to any photographer and to see lights that are not only bright but offer a nice clean coverage of the cage was very encouraging for this first time cage side shooter. We also had Alvin from Canon Imaging Academy with us that night to help, guide and offer pointers to us who are shooting cage side for the first time. From practical advice to gear setting suggestions, the feelings of nervousness and fear slowly gave way to excitement as I waited for my turn. Add the roaring audience to hype the atmosphere thanks to great 6 matches before me, the weight of carrying my Canon EOS 5D Mark III and Canon EOS 7D Mark II with the trinity lens left my work tired shoulders and a new found sense of strength settled in. The first thing that hit me when I walked up to the cage to take up position beside Alvin was the size of the cage. It was big and there were many support beams that might obstruct my view of the action inside. Another worry I had was the cage itself which might interfere with the autofocus of my Canon EOS 7D Mark II and also the fear that the action might happened too close for my Canon EF 70-200mm f/2.8L IS II USM to focus on. Thankfully Alvin calmed my fears with tips to focus through the holes in the cage and to go for the close up action. With these in mind, I rested my trigger finger on the Canon 7D mark II shutter armed with the Canon EF 70-200mm f/2.8L IS II USM while I placed my Canon EOS 5D Mark III with the Canon EF 24-70mm f/2.8L II USM next to me just in case. The action was fast and furious as Lowen Tynanes dominated Kuat Khamitov for three rounds in a gruelling lightweight bout. While there were times that the crowd booed at Khamitov for trying to learn from Mayweather in his recent fight, the technical prowess of Tyanens’ grappling skills made sure Khamitov didn’t have much opportunity to run as he smother Khamitov on the mat with vicious ground and pound for the last round. This was where I went in close to get my shots of action as Tynanes grappled Khamitov for take downs and ultimately pinned him to the ground. Alvin’s also advice came in very handy especially when they were near my side of cage which meant I couldn’t frame the whole action, thus I went in close to capture Khamitov’s face for his emotional facial expression. Great win for Tynanes which meant a lot especially with his come back to MMA action. 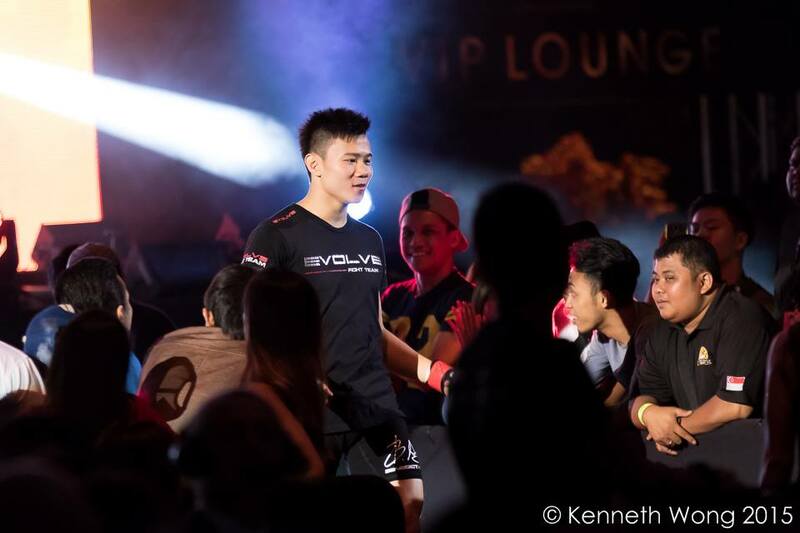 The second match I covered was between Ev Ting and Marat Gafurov which proved to be another exciting one… from an audience point of view as for me, it was too fast and too furious and really pushed me to keep up with the action. A highly-anticipated match up between two highly skilled opponents, the match ended in spectacular fashion with Gafurov forcing Ev into a submission victory and continuing his unbeaten streak in one round. This meant that unlike the previous match, I didn’t have the luxury of 3 rounds to shoot but rather just 1 round. Again I made use of the range afforded to me with the Canon EF 70-200mm f/2.8L IS II USM on the Canon EOS 7D Mark II ‘s crop sensor to go in close. This allowed me to capture shots of Gafurov pinning Ev to the ground and utilising both his fist and elbow to inflict damage. The range also allowed me to capture the facial expression as the blows continued to rain onto Ev. With the Canon EOS 7D Mark II ‘s sensor and autofocus prowess, the images came out nice and clean considering the higher than usual ISO to ensure I capture these split second shots with high shutter speeds. Details were clear and emotions could be felt that night as I opened them on my computer to look at the photos. Part of me actually felt bad capturing these rather painful moments of the fighters on the receiving end of the blows but it also reminded me of the potential of the cameras and that my purchase of the Canon EOS 7D Mark II was worth it. Even though my Canon EOS 7D Mark II and Canon EF 70-200mm f/2.8L IS II USM were my main camera for the night, I also snapped a few shots of the ring and its magnificent lights with my Canon EOS 5D Mark III and Canon EF 24-70mm f/2.8L II USM and Canon EF 16-35mm f/2.8L II USM as well. I always had an interest in stage and sports photography but to get something which combined both into one was just unbelievable and definitely a tick off my bucket list. Thank you Canon EOS World again for the opportunity to cover the event and for both John and Alvin for helping the 5 of us settle in for an experience that would leave a long lasting impact in my journey as a photographer.